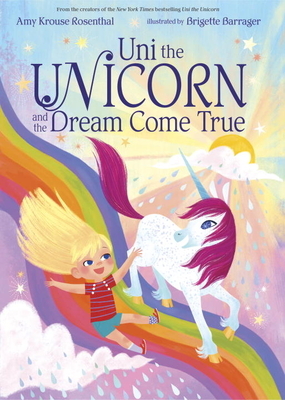 Amy Krouse Rosenthal and Brigette Barrager take us back to the vivid world of Uni the Unicorn to once again show us just how powerful belief can be. AMY KROUSE ROSENTHAL is the author of lots of books for children (such as That’s Me Loving You, On the Spot, and Uni the Unicorn, of course) and even some books for grown-ups (like Textbook Amy Krouse Rosenthal and Encyclopedia of an Ordinary Life). You can find more about Amy online at whoisamy.com. BRIGETTE BARRAGER (Uni the Unicorn) is an artist, designer, and illustrator and writer of children’s books. She spent some time at Pixar and Walt Disney Animation Studios before taking the plunge into freelance illustration, where she’s lived happily ever after. She resides in Los Angeles with her handsome husband, cute doggy, and terrible cat. Visit Brigette at brigetteb.com.